Figure 1. Ms. Kat Medina and Mr. Miguel Lope Inumerable (both center), pose with Vice Consul Raisa Mabayo (far left) and Vice Consul Ralf Roldan (far right) at Matadero Madrid during the inauguration of their exhibit. Figure 2. The artists explain their work as their Artist Residency Program in Madrid concludes. 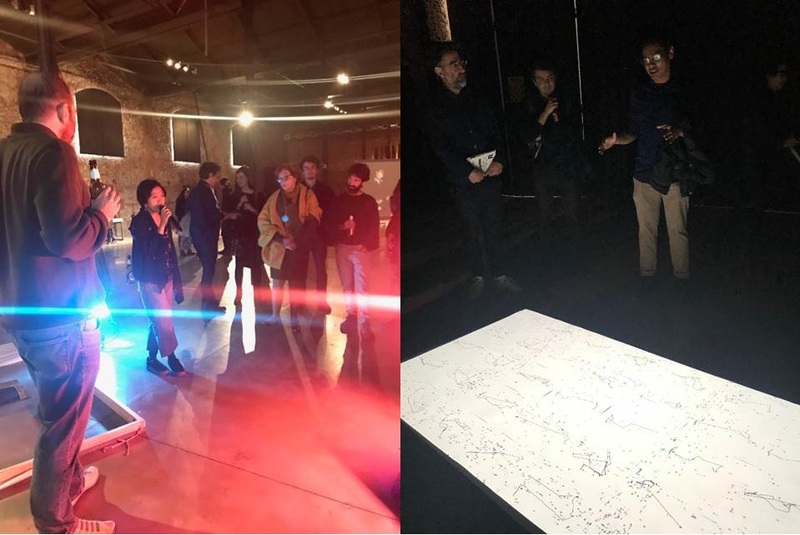 Filipino artists Miguel Inumerable and Kat Medina recently concluded the El Ranchito Artist Residency Program with the launching of their art installations on 25 November 2017 at Matadero Madrid. The program, which ran from 16 October 2017 to 26 November 2016, was organized by Matadero Madrid. 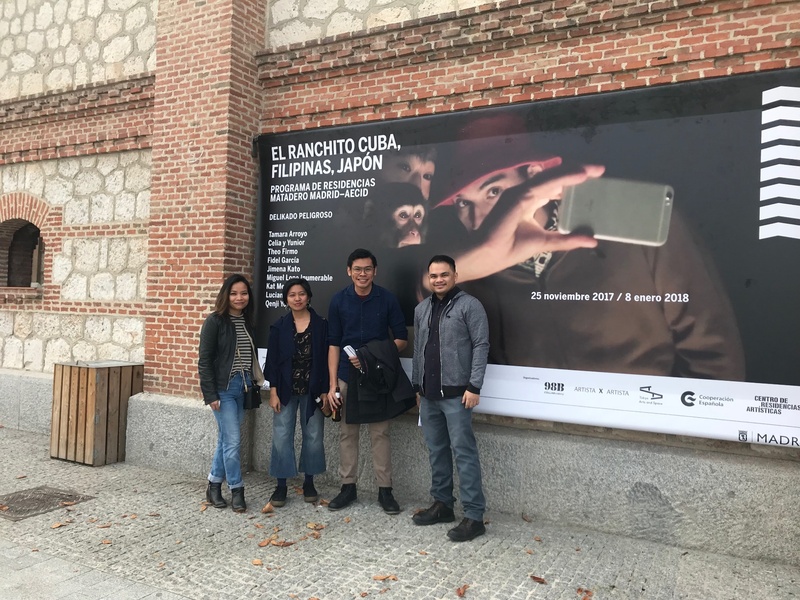 The two Filipino artists’ participation was made possible through Matadero’s collaboration with the Philippine-based art and cultural initiative 98B and the National Commission for Culture and Arts (NCCA). Other artists from Japan, Cuba, Argentina, and Spain also took part in the residency program. Mr. Inumerable’s work focused on the representation of the division of time spent inhabiting either the physical or digital spaces, and creating an overlap of them through a program he created that generated the data used while using social networking and other apps projected over printouts of his routes in Madrid. He reflected that it was inspired by always inhabiting one space while sacrificing the other, thus the effort to fuse them through his work. Meanwhile Ms. Medina’s work, which used a Philippine fishing net and everyday items such as plastic cups and orange peels, expressed the tension the artist felt while living briefly in Spain during the residency and feeling isolated from not being able to quickly find finding a deeper connection between Spain and the Philippines. Last week, the two artists shared their knowledge and experience through a workshop conducted at the Sentro Rizal of the Philippine Embassy for artists from the Filipino Community. The exhibit will run until 8 January 2018 at the Centro de Residencias Artísticas de Matadero Madrid.